from 10 pcs. 8.55 € 5% -0.45 €/pcs. The Black Tiger Shrimp (Caridina mariae, formerly Caridina cf. cantonensis) features a strong black colour coverage. 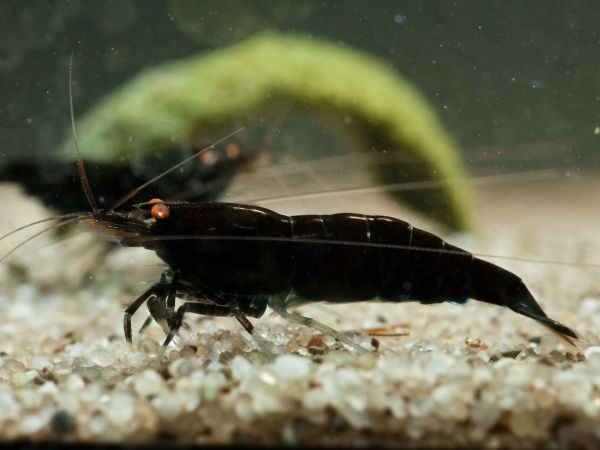 The wild Tiger shrimp originally comes from the oxygen-rich spring streams of southern China, the black variation was created by targeted mating and selection in the aquarium. The term Black Tiger Shrimp "OE" describes their special eye color and stands for "Orange Eyes". These have flowed into the gene pool of the Black Tiger Shrimps through targeted mating with blue OE representatives of the Tiger shrimp and appear as "glowing" eyes due to the strong contrast to the black body coloration. The Tiger dwarf shrimp grows up to 3 cm and 2 years old. When it comes to setting up and arrange a tank for Tiger shrimp, they don’t have demanding requirements. Some moss, wood and leaves offer them and especially pregnant females of the Black Tiger Shrimps opportunities to hide. Once the animals have settled in and feel good, breeding is easily possible with appropriate water parameters. The females of the dwarf shrimp release up to 30 juveniles every 5-6 weeks. Plants, as well as moss pads, stones, pipes and clay caves are ideal hiding places for the shrimp babies - which is particularly important in community aquariums. When keeping Black Tiger Shrimps with fish rather small species should be selected: Small Boraras and so-called mini or “Nano fish” are the best choice. For breeding the Black Tiger, however, we recommend a single species tank, which is already possible starting with a tank size of about 10l. If you want to keep several shrimp species together, you should know that the Black Tiger Shrimp crosses with other Tiger shrimps, as well as bee shrimp (Black and Red Bees), bumblebee shrimp and Taiwan Bees (or also known as Shadow shrimp) due to the close genetic affinity. In line with this, also with all variants of the Taiwan shrimp, including Pinto, Multistripe, Backline, Panda, King Kong, Red Wine, Red Ruby and the Red & Blue Bolt shrimp. In general, keeping Tiger shrimp is fairly straightforward... they are considered as quite robust and tolerant regarding the water values. In the beginnings the Black Tiger Shrimp was known as delicate breed – but since the blue Tiger was crossbred this resulted into a stunning and robust shrimp. Good water quality and the appropriate water values ​​are prerequisites for successful keeping and breeding. Tiger Shrimps are omnivorous, so buying special food for Black Tiger Shrimps isn’t necessary: All common types of food are well accepted - with our GlasGarten Shrimp Dinner we offer a staple food for shrimp - important is a varied diet. Powder foods are especially suitable for raising baby shrimps and juvenile shrimps. For this purpose, we have developed our GlasGarten Shrimp Baby Food, which also meets the higher energy needs of young shrimp. Our GlasGarten Bacter AE is very well suited for the promotion of the biofilm, which shrimps like to graze. Less is more – this also proves well-founded when feeding Black Tiger Shrimp. The amount of food should be adjusted so that it is eaten within a few minutes, so the food doesn’t remain in the aquarium for several hours and unnecessarily pollutes the water. When feeding shrimp generally counts: feed better more often but smaller amounts.